This Saturday 2nd August in Dublin there will be another march in solidarity with the people of Palestine, especially those trapped in Gaza who are being killed in their hundreds, maimed in their thousands and terrorised in their entirety by the Israeli war machine. 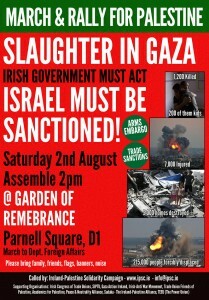 Assemble 2pm at The GARDEN OF REMEMBRANCE, Parnell Square, Dublin 1. March to Department of Foreign Affairs, St. Stephen’s Green. Please bring friends, flags, banners, noise. We would ask that you do not bring party-political flags (Irish, Palestinian or others). We are also asking people to bring flowers to leave at the Department. This week we are bringing the march to the Department of Foreign Affairs. Clearly, the Irish government is out of step with the views of the people of Ireland on this issue. For almost a month thousands upon thousands of people have protested all over Ireland, both in solidarity with the people in Gaza and demanding Irish action. Sadly, the government has not listened, and has taken no action to sanction Israel. We must tell them that €500,000 aid is welcome, but it is time to take concrete political action to sanction Israel for its ongoing crimes against the Palestinian people. This slaughter must end immediately, and Israel must be held accountable for its criminal actions against the Palestinian people. Israeli impunity must end. The Ireland-Palestine Solidarity Campaign will be asking the Irish government to play their part in imposing sanctions on Israel by calling for an international arms embargo on Israel and calling for Israel to be suspended from the Euro-Med Agreement which grants its trading privileges with the EU, amongst other things. The Israeli state has launched a fresh assault on the Palestinian people, a collective punishment of a captive population. Israeli officials are now talking about “expanding and intensifying” the assault on Gaza which has already killed some 1200 people, the vast majority of them civilians including over 200 children. Over 7,000 people, mostly civilians, have been wounded, including almost 1,500 children and 1,000 women. 500 houses have been targeted and destroyed and 1000s of others extensively damaged, while at least 215,000 civilians have been forcibly displaced. Attacks have also been taking place in the West Bank for the two months month, where at least 20 people have been killed. Join us this Saturday to make your voices heard, and tell the government that it’s time to sanction Israel.